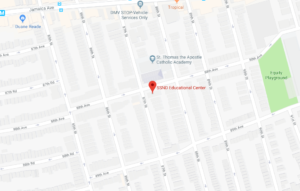 In Sister Linda’s words: We began our trip to the SSND Educational Center in Queens leaving Baltimore for a 3 ½ hour trip to NYC. Everything smooth! Then the four non-New Yorkers navigating 4 subway transfers with suitcases and backpacks from NYC to Queens was an unforgettable experience of another 3 ½ hours!! However, we did arrive safe and sound to have 4 smiling SSNDs at the door welcoming us with literally open arms. Sister Cathy, Sister Jean, Sister Bern, and Sister Eileen. Their hospitality was just as warm and welcoming all week long. We also experienced that hospitality during the week in the staff of SSNDEC led by Sister Cathy Feeney. In the morning, after our prayer with the Sisters, our day at the center began. What a happy, holy, joy-filled place. Each day each one of the students met with a small group for conversation. We learned so much about the women as they spoke in English telling us about their lives, their hopes, their dreams, their struggles, their countries. Truly it was “holy ground” we were standing on. The women, all immigrants, shared their stories and lives so openly and trustingly with us. It was standing under that waterfall of blessing just being showered with each woman’s sharing. Before our trip the NDMU students and I talked about mutual ministry—both sharing themselves and being enriched and learning from the other and, dare I say, being changed by the encounter. All real life is meeting, being present, and listening lovingly. I think we all experienced that in the English Conversation groups. We grew to know and love the women. After the conversation groups, the students lead an interactive session with the women. Nia Willis, an art therapy major, did mandalas with the women. Gerriza Balmes, a psychology major, had a session in Stress Management (and Mindfulness), Ciarese De Torres, a nursing major, shared tips on First Aid. Again we experienced “mutual ministry”, giving and receiving at the same time. In her session, Iza talked about how sometimes college can be a stressor for her. The women almost all spontaneously said for them school, being at the SSNDEC, was not a stressor. It was a safe haven, a place of refuge and relaxation, a community. Indeed we could easily understand how true that was! It felt as if we touched into the hopes and dreams of these women, their dreams for freedom and possibilities and also their strength and dedication to hard work and sacrifice to achieve their goals. From the first day I felt as if we were accepted into the community. 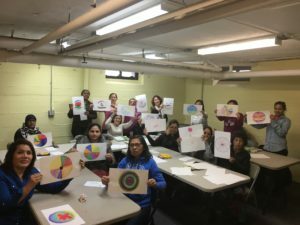 The SSND spirit of “making one”, unity in diversity, educating to reach our potential—all is palpable in SSNDEC among the Christian, Jewish, and Muslim women—sharing life together. 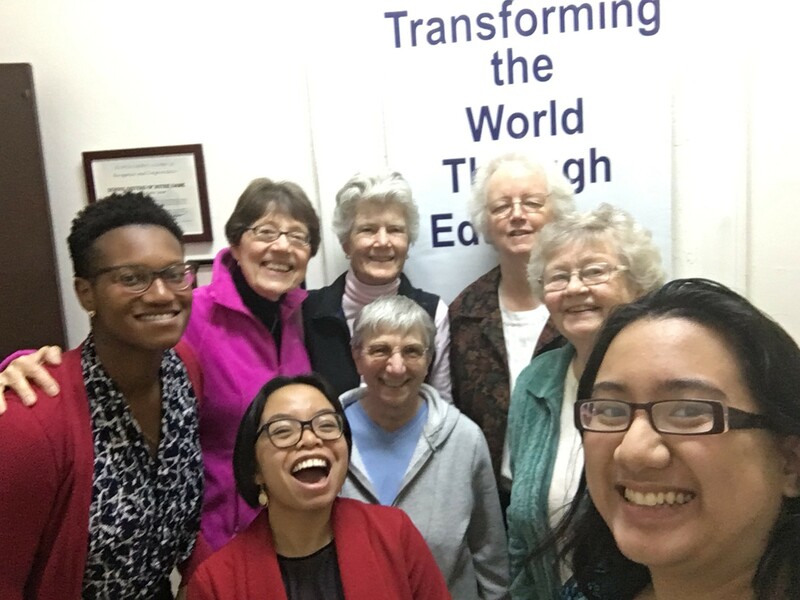 Each day Sister Jean leads prayer with the women. It is again palpable holy ground. The incredible diversity that is New York was also felt on our day at the United Nations planned by Sister Eileen. Also sharing morning prayer, evening prayer, and reflection on our day with the sisters was a gift and a blessing. Living with Sisters Bernadette, Eileen, Cathy and Jean was hospitable community in action. Again standing under the waterfall of God’s blessing! !